John Ernest Laidlay wad born on the 5th of November, 1860, at Seacliff House, two miles east of North Berwick. His father was an Indigo manufacturer in Calcutta before he acquired the estates of Seacliff, Auldhame and Scoughall which then passed to John’s brother Andrew Laidlay who perished in a fire which destroyed Seacliff House in 1907. 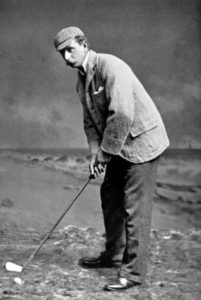 Johnny Laidlay dominated the Amateur Championship for seven years from 1888, winning twice in 1889 and 1891 and runner-up 1888, 1890 and 1893. 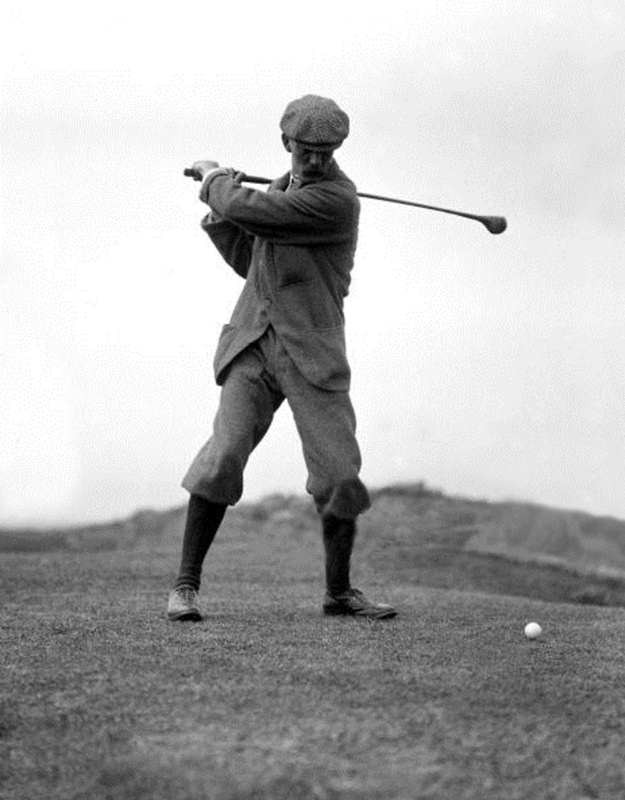 Laidlay was a member of a number of golf clubs and throughout his career won over 131 medals. In 1887 alone he won eleven first medals and two seconds, three of these being won with record scores – 83 at St. Andrews, 72 at North Berwick and 79 at Musselburgh. In 1885 at Carnoustie he set a new course record 77 which stood for several years. Many of his medals are now on display in the British Golf Museum. Laidlay learned to play the game over the links at Musselburgh while attending Loretto School. He was tutored by local pro Bob Ferguson, three times Open Champion. While at Loretto, Laidlay was presented with a cleek and a brassie. He used the cleek head as his putter ever since. The children’s course at North Berwick was the chief haunt of Johnny Laidlay where he learned to perfect his pitch shots required on every hole. He was an advocate of physical fitness for all sports and at school he was the only boy who could draw himself up on a horizontal bar by the use of one hand alone. At the age of sixteen, Laidlay went round the nine-hole course at Musselburgh in 36 strokes, scoring four at each hole. He used a cleek head putter got from old Willie Park at Musselburgh which he re-shafted over the years. The first open amateur competition he entered was in Yorkshire in 1878, and that year he played his only game for the Scottish Cricket Team. His brother W. J. Laidlay also played cricket for Scotland. In 1885, Johnny Laidlay played in the first Amateur Championship at Hoylake and was defeated in the early rounds by John Ball. This was the first of many titanic encounters Laidlay was to have with the talented Englishman. They were of a similar age, and died within a few months of one another in 1940. Laidlay was eighty at the time of his death and Ball seventy-nine when he followed his rival to the grave. At the first championship, Laidlay was using a mashie which was a new club at the time. He used it very effectively on his approach shots, slightly cutting the ball with a laid back face which landed softly, ideal for the elevated greens on the early course at North Berwick. In 1882, Messers J.E. Laidlay and J. Wharton Tod challenged any two professionals of North Berwick. The challenge was taken up by John Menzies who brought forward Ben Sayers and Willie Dunn to answer it. The amateurs were five down, Ben Sayers and Willie Dunn doing the round in 74. Laidlay had an amazing record which included wining ten gold medals at Musselburgh, ten at Muirfield and a further nine silver medals. In 1878, at the age of eighteen, he joined Luffness Golf Club playing over the old course near Aberlady. In 1883 he became a member of the Honorable Company of Edinburgh Golfers at Leith, and two years later he joined the Royal & Ancient Golf Club at St. Andrews. Laidlay’s caddie was Jack White who apprenticed as a club maker with Tom Dunn at North Berwick before joining the professional ranks at Sunningdale. These alterations changed Laidlay’s game immeasurably and in a two-week period in 1885 he won a tournament at North Berwick, another at Carnoustie, and the King William IV Medal at St Andrews. The overlapping grip used by Laidlay was erroneously credited to Harry Vardon, but historians now agree that Laidlay was the first to use the overlapper. In Willie Park Junior’s book, “The Game of Golf,” published in 1896, he remarked that there were only two players he knew who adopted the overlapping grip and they were J. E. Laidlay and J. H. Taylor. It was in the year the book was published when Harry Vardon leapt from obscurity into fame by becoming Open Champion, eight years after Laidlay was using the overlapping grip. Vardon has never claimed to be the first to discover the grip, all that he recalled is that he worked it out for himself in the period when he was at Bury and Ripon. It was Vardon’s use of it, however that brought it into general acceptance, and with minor variations it is the grip used by the vast majority of golfers today. 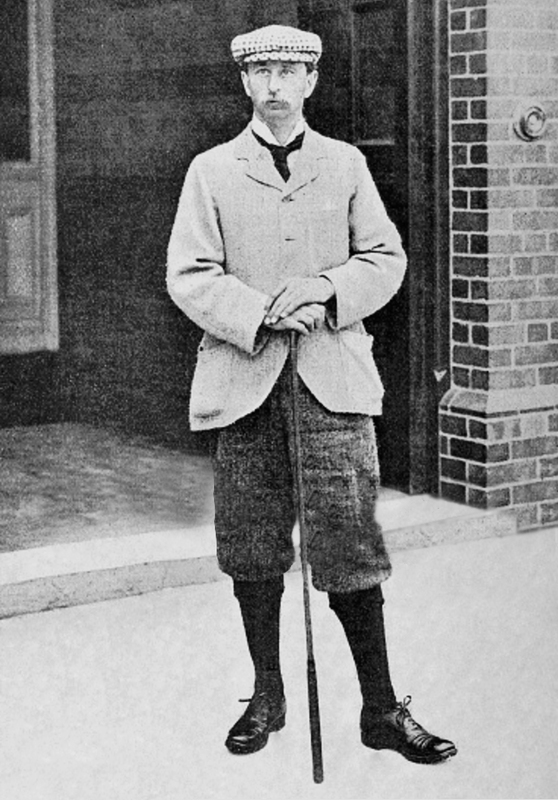 During practice before the 1889 Amateur Championship at St. Andrews, Laidlay had lost his game and could not hit a ball. In desperation, he took out Willie Campbell to try and find out what was wrong. They tried everything and as a last resort Campbell suggested that he should hold his driver at the bottom of the leather – and it worked. Laidlay won the Championship and held his clubs short ever since. In the final, he defeated Leslie Balfour Melville at the nineteenth hole. As the public began to lose interest in the professional money matches with rumors of match fixing, the top amateur players began to attract thousands of paying spectators in exhibition matches. In 1888, the North Berwick Town Council organized an open competition for amateur players to attract more visitors to the town. Laidlay persuaded Horace Hutchinson to be his guest at Seacliff for the week and enter the competition. They both reached the final and, after extra holes, Laidlay was the winner. Laidlay won the Amateur Championship again in 1891 after defeating Harold Hilton in the final at Hoylake. Laidlay played in the Open Championship thirteen times from 1885 to 1901. He was leading amateur four times in 1887, 1889, and 1893 when he finished two strokes behind the winner, Willie Auchterlonie, and again in 1901. He played for Scotland against England ten times between 1902-1911 and his handicap was plus four at the age of 58. He was Captain of the following clubs, Prestwick (1894); Honourable Company (1904); North Berwick Golf Club (1906) ; North Berwick New Club (1913-15); Tantallon Golf Club (1906-08). Laidlay was also a member of Dunbar Golf Club and in 1884 he won both the Roxburghe and Club Gold Medals. Sir Hew Dalrymple of Leuchie presented Laidlay with a set of nine Hugh Philp clubs, either for wining a competition at North Berwick (which was the practice) or in recognition of his triumph in the Amateur Championship. 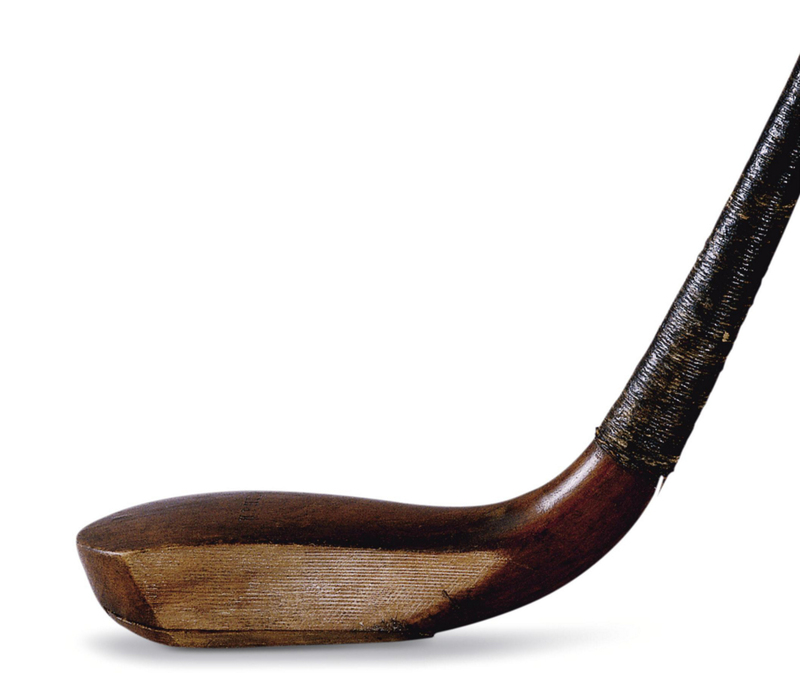 The clubs were crafted in the early 1850s at St. Andrews when Robert Forgan was Philp’s assistant. They were displayed at the Glasgow International Exhibition of 1901. Unfortunately, in 1981, the set was broken-up with each club sold individually at Sotheby’s in London. This exceptional Philp putter came from the collection of John Laidlay, a two-time British Amateur Champion and runner-up in the 1893 Open Championship. It formed part of a set of nine Philp clubs presented to Laidlay by Sir Hew Dalrymple, Bart., of Luchie. The set of clubs was displayed at the Glasgow International Exhibition of 1901, at the request of the Reverand John Kerr who suggested to the archaeology committee that there should be a golfing exhibit and then took on the role of curating it. The exhibition opened in May 1901 and ran for six months. All golf treasures were kept safe in an isolated, fireproof structure, lit throughout by electricity and guarded day and night. The “Laidlay” collection was displayed in its own special case. It is believed that the Laidlay clubs were created in the early 1850’s with the help of Robert Forgan, Philip’s nephew and assistant. They were to be awarded as “prize clubs” to the winner of a competition. (Smith 1867, 11 & 18). The putter appears to never have been used. 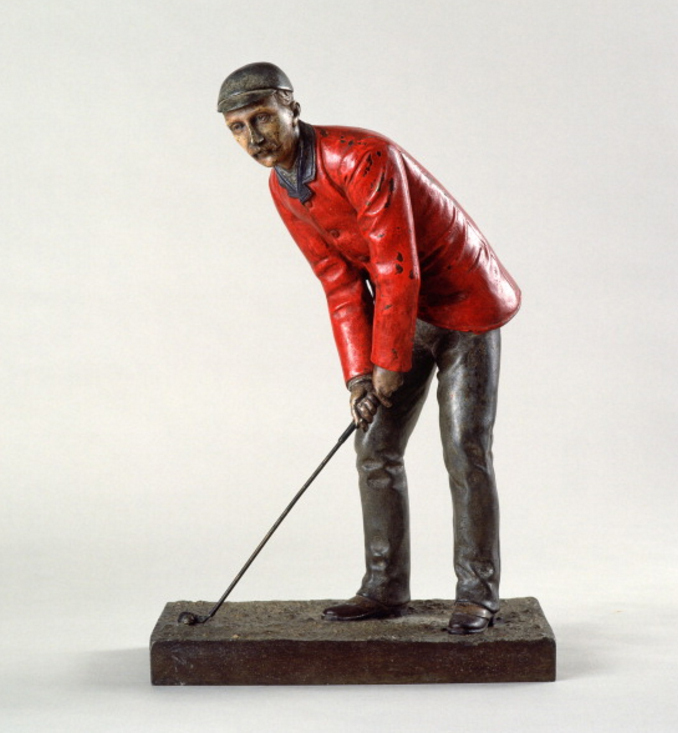 In 1981 the Laidlay collection was broken up and each club sold individually at Sotheby’s golf auction in London. Laidlay played an unusual round before each championship, when with Jack White as his caddie, he would play a ball from the first tee at North Berwick to the Roundel Hole at Gullane, six miles away by the way of Eel Burn Hole, the sands along the shore, the neighborhood of the fishermen’s cottages and away over Muirfield in the rough country to the top of the hill, playing from whatever lie his ball chanced to find, and once doing this course in a total of 97 strokes. Johnny Laidlay played the North Berwick course daily and his regular foursome partners were Walter de Zoete, John Penn M.P. and Arthur Balfour. 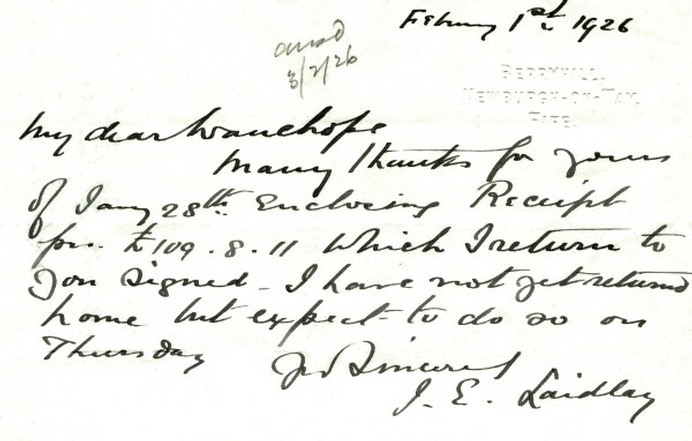 In 1886, Arthur Balfour, as Chief Secretary for Ireland was obliged to have two detectives with him at all times. They would shadow him on the West Links, disguised among the sand dunes. Laidlay supported the Ladies Golf Association and refereed many of their important matches along with Robert Maxwell, Leslie Balfour-Melville and Captain Charles Hutchings. He was also a skilled photographer and often visited the Bass Rock, capturing the young gannets on camera. The rocky stack lay a mile offshore and dominated the views from Seacliff House. He also enjoyed catching lobsters from his boat in the harbor below the mansion. Laidlay was a Justice of the Peace and attended Haddington Sherriff Court. In 1899 he built Invereil House overlooking the eighth fairway on the West Links, North Berwick, where he resided with his daughter Faith Laidlay. Following the First World War, he moved to Sunningdale with his wife Eileen where his former caddie Jimmie Sheridan from Ferrygate Farm, Dirleton was the caddie master and they called their house ‘Auldhame’ after his family estate at North Berwick. Amateur players like Johnny Laidlay and Robert Maxwell lived on independent means and were able to play golf everyday. The Amateur Championship was originally played for among the blue-blooded fraternity and a closed shop to artisans. The competition played over a week precluded the local tradesmen from taking part. Even in local competitions the joiners, teachers and clerks who played to a high standard within their golf club could not compete against Maxwell or Laidlay who were full time golfers. At the age of 61 years, Laidlay played for Sunningdale against Oxford University and was a tough opponent over 36 holes. Laidlay and Maxwell played during a period when amateur golf was at its height of popularity and the standard was of a high quality although the professionals continued to dominate the Open Championship. His daughter Eileen ‘Faith’ Laidlay was a member of North Berwick Ladies Golf Club and her brother Peter Laidlay was a member of Sunningdale Golf Club. Johnny Laidlay died on the 15th of July, 1940, aged 80 years old and is buried in Holy Trinity Cemetery, Sunningdale, Berkshire.